Same rules as Vetka puzzle/game. This was one of the last programs for MSX I had written. I hadn't been programming for MSX for a very long time. My MSX archives on floppy disks were covered with thick layer of dust. But suddenly Ugputu, a good friend of mine, let me use his MSX for couple of months. This ignited old flame and I wrote couple of programs. One was VETKA.NSG. 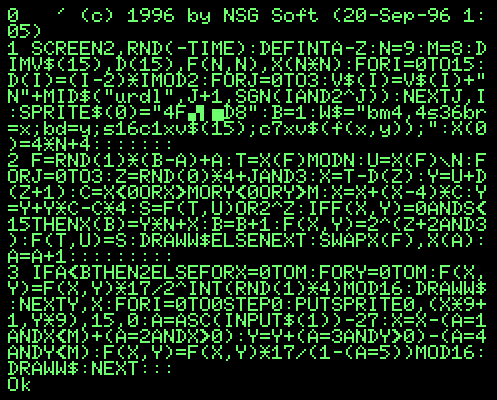 It started as regular MSX-BASIC implementation of Vetka and that grew pretty complicated. However I decided to give it a shot at nsg-izing it. Character by character it shrank first to 10 lines, then to 5 and at that point I believed I can squeeze it into 3. Certain sacrifices had to be made, and the program as a whole has unfinished element to it. For example it does not detect endgame, there was not enough room to squeeze in color statement, so it assumes that screen is in "color 3,1,1" and tile images are so rudimentary that it is hard to tell boundaries of cells. For a long time this program, together with all other programs that I wrote during that period, was presumed lost. Fortunately, on October 2, 2009, while looking for something else entirely, I have found a big fat .arj file and deep inside this file there was a subdirectory inconspicuously named "MSX". And that is where the VETKA.NSG stayed for all these years.